The unicorn is a horse-like creature said to live in the forests of Europe, Eurasia, and India. Its appearance mostly differs from a horse in that it has a great spiral horn sprouting from the middle of its forehead, but Medieval illustrations and descriptions of it also include a bearded chin, furry ankles, cloven hooves, and a lion-like tail... its fur color was often shown as white, tan, or brown. The unicorn was once known by the name “monokeros” (or “monoceros”: Greek for “one horn”), and was described by Roman naturalist Pliny the Elder [23–79 CE] as having “the head of the stag, the feet of the elephant, and the tail of the boar, while the rest of the body is like that of the horse.“ Pliny seems to have mixed features of a unicorn and a rhinoceros... but in a book created around 1200 CE, called the Aberdeen Bestiary, Medieval authors quoting Pliny stuck his description firmly next to an illustration of a very horse-like unicorn. The earliest known mention of the unicorn was in the writings of Ctesias, who collected stories of the beast in Ethiopia sometime around 400 BCE. He states that when the unicorn is pursued and cornered by hunters, it will escape by throwing itself from a cliff and twisting in the air so as to strike the ground horn-first. Due to the tremendous power within the animal’s horn, all the force of the fall is canceled, and the unicorn can walk away completely unharmed. Oh, and just so you know: in the same text Ctesias describes rhinoceroses as an entirely different animal... so he wasn't confusing a rhino for a unicorn. India, Ctesias tells us, was home to both unicorn horses and unicorn asses, and the horn of either beast has the mystical ability to completely neutralize all poisons and to heal all wounds. For this reason, unicorn horns – known as “alicorns” – soon became a prized commodity, and unicorns were often pursued by hunters who wished to sell their horns to kings and queens (who often worried about being poisoned by enemies). This was a very profitable sale, justifying the danger of procuring the alicorn; in the 16th century, Queen Elizabeth paid 10,000 pounds to buy one. That was equivalent to the cost of a castle! The greedy hunters soon discovered what a powerful foe a unicorn is; up to three men can be impaled upon their horns at a stroke, they are as fierce as any lion, and ancient authors agreed it was impossible to capture a unicorn alive. Unicorns were thought by many people to simply be undefeatable in a fair fight... so someone figured out how to trick them. 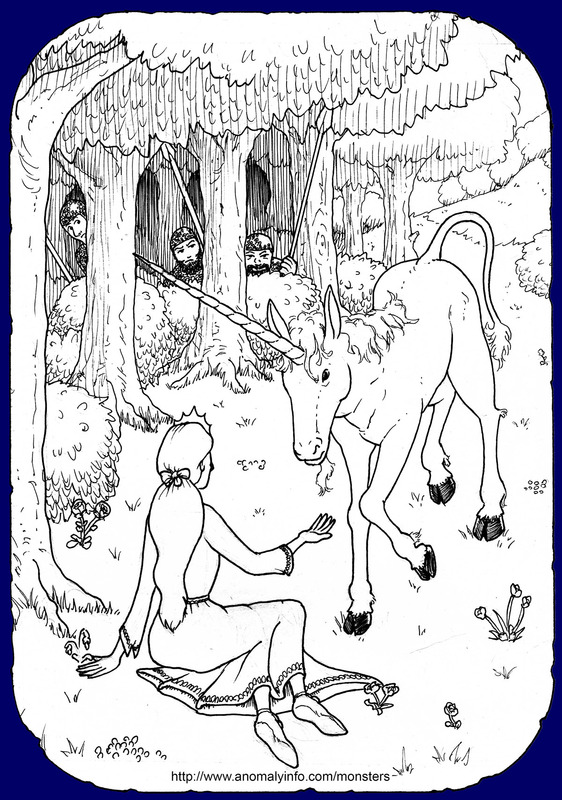 Somehow, it was discovered that unicorns are naturally attracted to young maidens. It was said that if a maiden sat still and was patient in an area unicorns frequented, eventually a unicorn would approach the young lady and lay its head in her lap, sometimes even falling asleep. This is when, of course, hidden hunters could strike and claim their prize... the alicorn. Many of the unicorn horns that were sold through the centuries have been examined by scientists who identified them as something else... narwhal tusks. The narwhal is a species of whale that lives in the arctic, males of which grow a long spiral tusk that juts out from their heads. Many people now assume that all “alicorns” sold in ancient days were actually just narwhal tusks. However, this does not necessarily mean unicorns didn’t exist; it just means the demand for their horns was high enough for swindlers to sell fakes! A Fantastic Bestiary: Beasts and Monsters in Myth and Folklore, by Ernst and Johanna Lehner, 1969 Tudor Publishing Company, New York, USA. 153-157. Ancient India as Described by Ktesias the Knidian: Being a Translation of the Abridgement of His “Indika” by Photios, and of the Fragments of that Work Preserved in Other Writers, By Ctesias, translated by John Watson McCrindle, 1882 Trübner & Co., London, England. pg.54-56, 92-95. Online: Click here! Bestiary - MS Bodley 764, reprint of a bestiary created ca. 1220-1250 CE, translated by Richard Barber, 2006 The Boydell Press, Woodbridge, England. ISBN: 0-85115-753-X. Pgs. 36-37. Encyclopedia Brittanica Online: Ctesias, 2008 website, Online: Click here! Medieval Beasts, by Ann Payne, 1990 New Amsterdam Books, New York, USA. ISBN: 1-56131-018-2. Pgs. 26-27. Mythical Monsters, by Charles Gould, 1886 London, England. Pgs. 338-346. Online: Click here! Narwhal Tusk Discoveries: Narwhal Intro, 2008 website, Online: Click here! The Natural History of Pliny, by Pliny, translated by John Bostock and Henry Thomas Riley, published by H. G. Bohn, 1857 - v. II. Pg. 281. Online: Click here!